True brand integration can be explored at many levels in the built environment — by looking at a monumental sign or sculpture, walking on an unconventional pathway, gazing at a large-scale graphic within a lobby, noticing subtle rhythms on wall sections, observing abstract patterns on carpet, discovering artfully cropped images on ceiling bulkheads, spotting playful words in wall niches, or by reading an exhibit or artifact display. These elements are environmental graphics — a tangible implementation of your brand. Strategically distributed, these graphics communicate your brand message and offer lasting impressions to your audience. Today's brand integration expectations go beyond two dimensional mediums. Our best brand practice integrates environments, information, culture, products, services, and people to showcase your story and become the connecting links for the spaces. We work together with you to discover your unique story, understand your vision, and provide a roadmap for your brand. We create cohesive environments that express your brand values. Along with branded environments, we orient visitors in navigable spaces through placemaking, signage, and wayfinding. As one of the immediate mediums to communicate with visitors, good signage and wayfinding should be aligned with code requirements and complement the architecture. In a campus exterior setting or vast interior space, we employ placemaking graphics to define the space and minimize the use of signage. Our expertise in brand identity and collateral packaging can help you create a compelling identity or a marketing refresh program. A comprehensive identity guideline will provide a good stepping stone to expand your brand integration beyond typical marketing collateral. 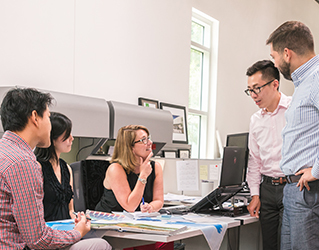 At Kirksey, we don’t see ourselves as brand design experts and interior architecture design experts; we see ourselves as one brand integration team collaborating to visualize your story. We provide a compelling graphic interpretation to every project in all market sectors.